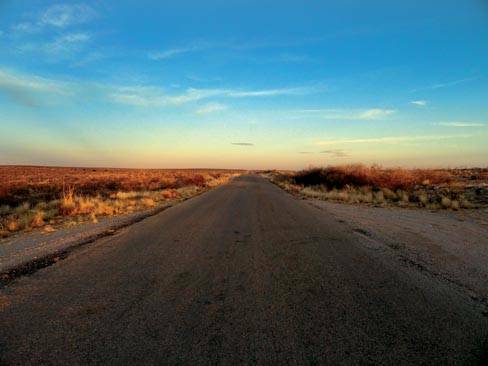 Thirty miles back Tim Baker had turned onto a two-lane paved road that appeared to offer a relaxing, less traveled route through northern Chihuahuan desert country. Now he was anything but relaxed. No cell phone reception, his new SUV’s navigation system indicated he was in an unverified zone, and the fuel gauge hovered above empty. And, he noted, the outside thermometer registered 97 degrees. Should he turn off the air conditioner and roll down the windows? No, he thought he remembered reading that would use more fuel because of drag. Anyway, it was too hot to consider. With pale white hands gripping the steering wheel, he began to question his decision to take a road trip to the West. Anxiety pushed his thoughts back two months. While working on a bid package for a new office tower, he had come to the realization that he was used up and burned out. For nearly thirty years he had thrown himself into his work to escape the horror of that grey afternoon when a truck roared out of a side street, crushed the passenger side of their car and vanished leaving him broken and emotionally scarred, watching helplessly as the life drained from his wife and daughter. Then, after years of faithfully plugging away in a cubicle world dominated by engineering designs with endless reviews, revisions and budget cuts, he put in a request for a six week sabbatical and was summarily denied. That was the last straw. The following morning he tendered his resignation and cleaned out his desk. Money was no problem, he had always been frugal. And although his hair was rich with silver, he was going on an adventure and didn’t care if he ever came back. Shopping online outfitters with care, he assembled a wardrobe to at least look the part of a modern Western explorer. He had even suffered through the required paperwork and bought a Colt .45 caliber Peacemaker revolver. It made him feel like a part of the West that he had only read about and seen in movies. His only regret was that his Honda Pilot sported New York license plates. A tenderfoot giveaway, no doubt, but it couldn’t be helped. The road continued to meander through low hills, and across depressions that admonished unwary travelers to watch for water. All he could see was a turquoise-blue New Mexico sky and a landscape filled with unfamiliar vegetation. Occasionally, dirt roads marked by blue signs with an inscrutable numbering system branched off to unknown destinations. Squinting, he could see a sign in the distance. Drawing closer, he saw it had been ravaged by sun and wind, but mercifully still advertised a gas station and convenience store in a hamlet only three miles ahead. He breathed a deep sigh of relief and turned up the volume on the CD player, pounding out The Magnificent Seven theme. Pulling up next to one of two pumps that dispensed either gas or diesel, he noted a sporty yellow car with black racing stripes and a spoiler parked next to an old, faded-green pickup in front of what looked like the gas station office and, if the sign out front had any merit, convenience store. A sheet of paper with faded blue writing was taped to each pump, advising the customer to pay in advance. Entering the station, Baker noted that the convenience part of the business amounted to a few racks of staples as well as the required potato chips, beef jerky, nuts, candy, and gum. Coolers held ice, sodas, sweet tea, bottles of water, and a limited assortment of beers. A rack above the cash register sported cigarettes and chewing tobacco. As Baker studied the meager fare, a kid of about 25 with a bad case of acne and threadbare, greasy coveralls emerged from the one-stall garage, wiping his hands on a rag. “I need to fill it up. I think I rolled in on fumes,” Baker said, trying to make small talk. Nodding in understanding, Baker looked through the open door into the garage. He saw a big man in a faded-gray Dallas Cowboys T-shirt and camouflage cap leaning against a white pickup with its hood up. The man was obviously watching his every move. “Uh, here, put it on this,” Baker said, handing a platinum card to the young man. “I’ll fill it,” Baker said. Turning, he walked back out to the Pilot and flipped the lever to access the fuel tank. He winced as the gas pump made a grinding sound when he pulled the nozzle handle. Relieved that gas started flowing, he looked around at the remnants of a small town. Broken-down buildings from a bygone era appeared to be long abandoned. A scattering of homes from the ’40s and ’50s, as well as a few ’70s-era mobile homes, seemed to harbor life, although most were unkempt and surrounded by rusting vehicles and various other objects that defied identification. Baker was half-listening to the kid and waiting for the transaction to clear the credit-card reader when he looked out the window. The big fellow was next to the Honda, peering in the windows and generally checking it out. “Well, I hope it works out for you here,” Baker said, looking back at the vehicle. The man was gone. “Sure. I’ll take a bag of chips and a couple bottles of water,” He pulled out a handful of small bills he had casually stuffed into his pants pocket at breakfast. Back in the Pilot, Baker opened up a bottle of water and the bag of chips as the air-conditioner did its job. Relieved at having a full tank of gas, he was ready to resume exploration of the West. South of the town, the road paralleled a dry riverbed. Dropping in elevation, Baker noticed that the plant life was changing dramatically. There were fewer types of cactus, and more shrubby-looking plants and what he believed to be yucca. There was also some traffic. Two white pickup trucks loaded with welders and tools for heavy-duty maintenance were headed north, toward the small town he had just departed. Glancing at them in the rearview mirror, Baker caught a glimpse of another vehicle that must have left the town not too long after he did. As the road climbed out of the draw, Baker looked again into the mirror. He could see that the vehicle was slowly gaining on him. The road straightened out and headed into the distance. Dirt roads splayed off the main road in greater number, and large, odd-shaped machines appeared that reminded him of prehistoric creatures. The machines had massive heads that bobbed up and down at the end of long necks of steel. Ahead, a large truck that looked like some kind of tanker was turning onto a dirt road leading to one of the machines. From somewhere deep in his memory emerged the term pump jack. Passing closer, he could see cylindrical tanks adjacent to the machine. He had entered oil country. Automatically, Baker looked into the mirror again. The vehicle was less than a mile back. Concentrating on the road as an oncoming tanker truck roared by, he returned his attention to the rear. It was a pickup. A greenish-colored pickup that looked a lot like the one at the gas station. Recalling the scruffy-looking big guy that he surmised belonged to it, Baker increased his speed and adjusted the cruise control to 65. Dividing his attention between the road ahead and the road behind, Baker started to worry. He was driving a new rig in sketchy territory and had not been as discreet as possible when paying at the gas station. His eyes shifted to the mirror; he could see that the pickup had gained ground. No question that it was the same one. He increased his speed to 70. Looking back, he saw a black pickup rapidly overtaking the old truck. A few moments later the black truck passed him as if he were standing still, but the green pickup remained in position. Despite the air-conditioning, beads of sweat popped out on Baker’s forehead. What was with this guy? Suddenly his mind filled with thoughts of the carjackings, robberies, and murders that appeared in the news every day. He needed a plan. If he watched and waited for one of those blue-numbered signs, he would brake quickly and turn onto the side road. Those roads had to go somewhere. If the green truck turned then, he would just drive like the devil to the nearest town, ranch, or whatever. If the truck continued on down the highway, he might feel foolish, but he could live with that. Protection. The Colt. With his right hand he lifted the lid of the storage box between the front seats and moved the holstered revolver onto the passenger seat. He knew it was loaded, but without a cartridge under the hammer. Touching the warm wood of the handgrips made him feel better, but only a bit. A mile slipped quickly by, then another, with the green truck matching his speed but advancing no closer. Sweat trickled into Baker’s eyes. Coming around a slight bend in the highway, he could see one of the big tanker trucks turning from a side road onto the highway. This was it. He had to slow for the truck anyway, so he paused, then suddenly braked hard and, tires squealing in protest, turned into the tanker’s thick dust. Quickly accelerating, he raced down the gravel road. It was bone dry, and clouds of dust billowed up behind him. What he hadn’t anticipated was the washboard surface. As much as he wanted to go faster, he was fishtailing all over, almost out of control. Ahead, he could see that the road split. Which way to turn? At the last moment, he chose right and felt the SUV drift on the gravel surface, then grab. Accelerating again, he stole a quick look over his shoulder and saw a fresh plume of dust approaching the turn he’d just made. “No! What’s he doing?” Baker cried out. A quarter mile ahead he saw one of the big pumps slowly moving up and down. He raced toward the machine and the two large holding tanks next to it. Too late, he realized there was no more road, only piled-up berms of dirt and rock surrounding a large open area barren of vegetation. He was trapped in a perfectly flat box canyon. He slammed on the brakes, and turned the wheel sharply to avoid hitting the pump jack. The SUV went into a full 180-degree skid, then slammed to a bone-jarring stop facing the entrance to the pad. Breathing heavily and shaking, Baker clutched the steering wheel to steady himself. Through the dust he could see that the green pickup was stopped less than a hundred feet in front of him, blocking any chance of escape. Unthinking, he killed the engine and sat staring ahead. Seconds ticked by. Baker slowly became aware of a monotonous, mechanical clunk-thunk . . . clank sound as the pump sipped oil from the depths. Unexpectedly, the pump and sound stopped. A deathly pall of silence fell on the scene. After what seemed an eternity, the pickup door slowly opened. The big man from the gas station got out and closed the door. As dust settled in the hot, unmoving air, Baker could see that the man had something in his hand. “Oh yeah? Then why have you been chasing me?” Baker demanded, still pointing the pistol toward the brutish-looking man. Baker slowly lowered the revolver. He didn’t know what to do with it, so he clumsily shoved it into his trousers. The big man hesitated for a moment, then slowly walked forward with arm extended and handed it to him. Baker took the wallet, looked at it, and then into the man’s eyes, unsure of what to do or say. Michael McLean is a mining engineer with a degree from the University of Nevada, Reno. A native of western Colorado, he lives in Carlsbad with his wife, Sandie.